March 2, 2015. The Executive Budget includes an Education Tax Credit (ETC) that would provide individuals and businesses with a substantial credit against income taxes owed for donations to private and public schools, or scholarship organizations. The governor’s legislation proposes a 75 percent credit rate, with individual credit amounts capped at $1 million. Any unused credit could be carried over to a subsequent year. Both businesses and individuals would be eligible to receive the credit on personal or corporate income tax returns. Total credits would be capped at $100 million per year. A related bill that passed the senate January 21 would allow a 90 percent credit rate and would allow credits totaling $675 million over the next three years. Family Tax Relief Credit: incomes over $300,000 not eligible. The ETC also stretches far beyond the bounds of the tax benefit provided by itemized deductions. For example, expenses for mortgage interest payments or charitable contributions made by households are eligible for a deduction on state personal income tax returns. The effective value of tax benefit for such deductions is a taxpayer’s tax rate times the amount of the expense or contribution. Thus, at most, the effective tax credit “rate” for deductions is 8.82 percent, the state’s top income tax rate. The state average effective income tax rate in 2010 was 5.6 percent—that is the benefit that New Yorkers get on average for a charitable contribution. The potential for the ETC to displace other charitable contributions is illustrated by this example for a married couple with $200,000 in adjusted gross income making a $10,000 charitable contribution. Under the governor’s proposed ETC, a $10,000 contribution would result in a state tax reduction of $7,500 since the ETC provides a tax credit calculated at 75% of the qualifying contribution. Moreover, the state has acted in recent years to limit the deductions for itemized deductions and charitable contributions for high-income taxpayers. New York reduces the amount of itemized deductions by 25 percent for married couples filing jointly with incomes in excess of $200,000, and by 50 percent for such filers with adjusted gross incomes over $525,000. Beginning in 2013, for those with New York adjusted gross incomes over $10 million, the state limits the itemized deduction to 25 percent of the federal itemized deduction for charitable contributions, and all other federal itemized deductions are reduced to zero. 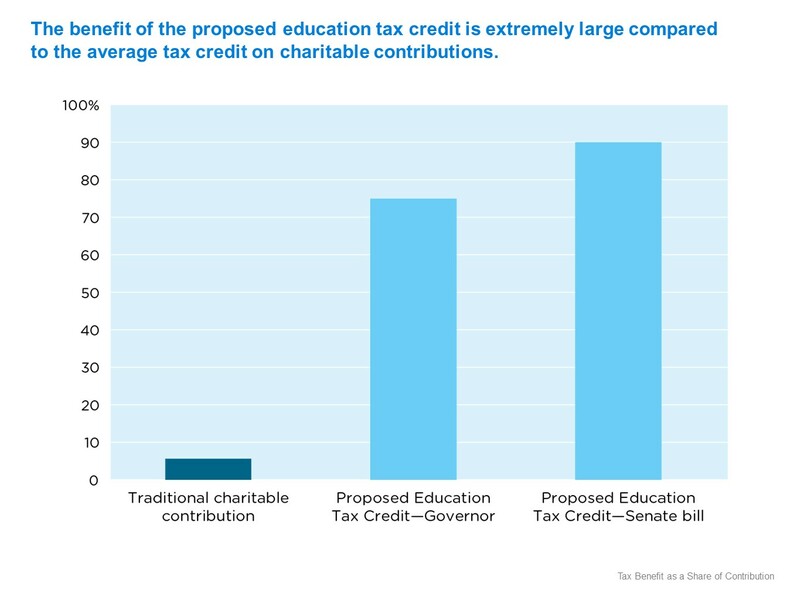 Since the proposed Education Tax Credit takes the form of a “tax credit” rather than a charitable deduction, it entirely skirts recently enacted state tax policy that limits the tax benefit available to high-income households for itemized deductions, including charitable deductions. Consider this example for a married couple with $10 million in adjusted gross income making a $1 million charitable contribution. Under existing state tax law, the state tax reduction would be $22,050 ($1 million times the 8.82% top state tax rate times the 25 percent limit on charitable contributions). Under the ETC, the state tax reduction would be $750,000 (the 75% Education Tax Credit times the $1 million contribution) or 34 times the amount the state would otherwise permit for non-ETC charitable contributions. Since the proposed allocation process favors those submitting applications to make contributions early in the year, there is the possibility that wealthy donors, corporations or financial partnerships would be able to claim all or a lion’s share of the credits early each year. An application would have to be submitted prior to making a contribution, it would have to be approved by the Tax and Finance Department and the recipient educational organization would have to be approved by the State Education Department. Furthermore, as noted above, because it provides a very lucrative tax credit, the ETC blatantly skirts the existing New York State limit on the deductibility of charitable contributions by very high-income households. The allocation process, the high ($1 million) donation limit, and the tax credit end-run around the charitable contribution deduction limit, would allow wealthy individuals or partnerships to potentially exhaust the $100 million annual credit pool, freezing out smaller contributors. While the Governor’s proposed ETC legislation goes to some length in specifying the educational entities and purposes that can qualify for the credit that does not alter the fact that the ultimate result could be to direct state revenues to purposes at odds with the general thrust of state education funding as required by the state constitution. Because New York State still heavily relies on local property taxes (outside of New York City) to support public schools, there are wide and alarming disparities in spending per pupil between property-rich downstate suburbs and many low-wealth school districts across the state. In partial response to these disparities and in response to the Court of Appeals decision in the Campaign for Fiscal Equity case, the state adopted a school aid distribution formula in 2007 that gave extra weight to public school districts with high proportions of low-income and high-needs pupils and more to low-wealth districts based on relative incomes and full property valuations. It has been a long-standing state policy goal to provide school aid based on this formula, although the amount of aid provided in recent years has fallen short of the commitment made in 2007. The ETC completely disregards that policy priority, and it would divert funds that should be applied to the funding shortfall. The governor’s proposed ETC legislation specifies that 50 percent of qualified contributions shall be allocated to public education entities (public schools but not charter schools), school improvement organizations (501(c)(3) non-profits that assist public schools in their provision of educational programs), and local education funds (501(c)(3) non-profits established to support public schools), and 50 percent to Educational Scholarship Organizations (ESOs, non-profits providing scholarships to non-public, including private and parochial, schools or public schools outside of a student’s district of residence, provided that at least half of scholarships go to students from low-income families.) In addition to the requirement that ESOs award at least half of scholarships to low-income students, there is a maximum allowable family income of $300,000 for any scholarship recipient. The ETC bill that passed the Senate has a $550,000 family income limit but no requirement that any of the scholarships go to low-income students. The Senate version also makes charter schools eligible for funding as public education entities. Such allocation criteria could result in ETC eligible contributions going to support public schools in high-income suburban school districts or funding scholarships at elite prep schools. The fact remains that there is nothing in the legislation to prevent a small number of wealthy individuals or businesses from garnering the bulk of the $100 million tax benefits and steering contributions to favor purposes completely different from the criteria used to determine the allocation of most taxpayer-funded school aid. A proposed tax credit of 75 or 90 percent is so extraordinary in the context of New York’s tax system that it warrants particularly careful consideration. This proposal is very nearly an outright reimbursement for a private expenditure and as such, is difficult to distinguish from an appropriation. It amounts to handing $100 million to wealthy individuals or business interests and allowing them to determine how to spend it. The governor, in his executive budget proposal, has tied the passage of the Education Tax Credit to passage of the DREAM Act. It is perverse and politicized policy-making to inextricably link two unrelated policy initiatives. The two measures should be acted on individually on their own merits. In his 30-day amendments, the governor dramatically upped the ante by linking passage of the Education Tax Credit and DREAM Act to the Tuition Assistance Program (TAP) appropriation. The governor appears to be willing to hold TAP benefits hostage until he gets his education tax credit passed. This is a new low even by Albany standards. Record Setting Inequality: New York State’s Opportunity Gap is Wider Than Ever, Alliance for Quality Education, January 12, 2015.